Sit on a chair or a bench with a mini band wrapped around your knees. Stand up from this seated position keeping your knees in a neutral position. If you want to increase the difficulty of this exercise, as you stand up point our toes outward and then stand up. Starting position- standing up straight with feet slightly apart, weight evenly placed on both feet. Hitch your hip up from your waist to shorten your right leg bringing your foot up off the floor. Keep the knee straight all the time. Hold, then lower slowly and repeat on the left leg. Lie on your side, both knees bent and your spine in neutral position. Draw your belly button inward to activate your abdominal muscles. While keeping your heels touching your hips directly over each other, raise your top knee towards the ceiling. The motion is typically small. Hold for a few seconds and return to starting position. Repeat and switch sides. ( Side-lying clamshells exercise restores strength to the gluteas medius muscle located on the back of the hip, which helps prevent excessive side-bending and therefore rotation of the spine) To add difficulty to this exercise you can wrap a mini band around your knees. Lie on your left side, straighten the bottom leg and keep the top leg bent. Lift the bottom leg up off of the ground and push the top leg down onto the bottom leg. 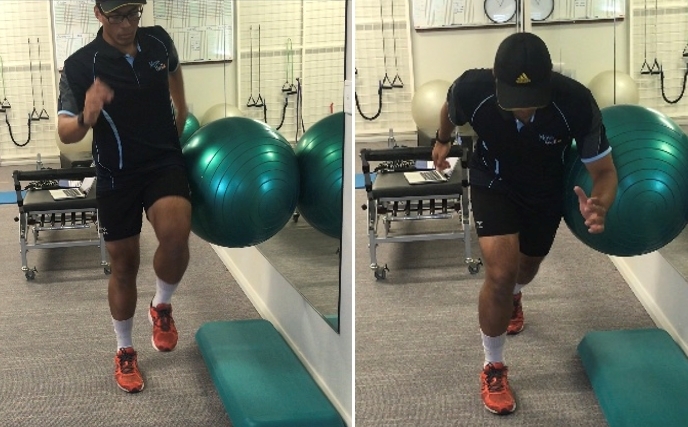 The aim of this exercise is to activate the gluteal of the bottom leg. You should feel a burning sensation if you are doing it correctly. Lie on your back, bring your heels close to your glutes. Lift up on your right leg, by pushing your hips to the ceiling. You are going to tilt your hips around the femur of your right leg. Keep your left foot pointed outward, tilt your hips to the left and the right. Do 8 reps each then switch legs. Control the movements to make sure that you are working your glute med. Start next to the bench shoulder-width apart. The box should be on your right hand side. Stand up tall on the box using your right leg ,contracting your glutes and quadriplegics at the height of the exercise. Step back down to the starting position. To add difficulty to this exercise, you can add weight to it. Be conscious of what your right knee is doing when you step up on the box. It needs to stay neutral and should not collapse inwards. Lie on your side, working leg on top, knees straight and hips straight. 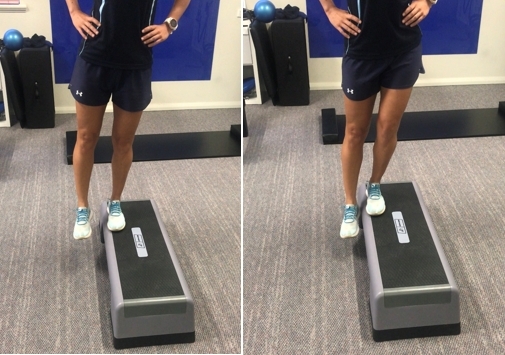 Lift the top leg, as high as possible, whilst maintaining pelvic stability. 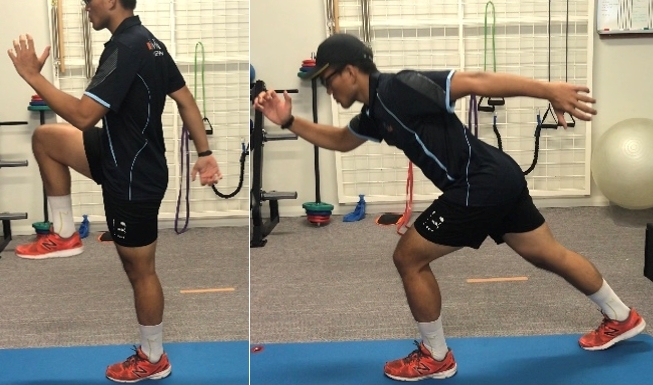 This exercise has been shown to be the most effective in recruiting glute-med- with approximately 80% maximal voluntary isometric contaction on EMG testing. ( Kirsten Boren, K; Conrey, O’Sullivan, The international Journal of Sports Physical Therapy) The positives of this exercise are of course the glute med activity levels, as well as the simplicity of the exercises and it’s low level of pain reproduction- for knee injuries especially. 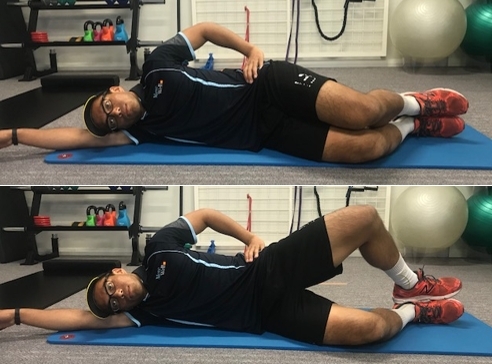 Another bonus is that, when performed correctly ( with hips in neutral and knees completely straight) it virtually isolates the glute med- reducing the role played by TFL and gluteus medius. The running man is a great example of proprioceptive and stability exercises. 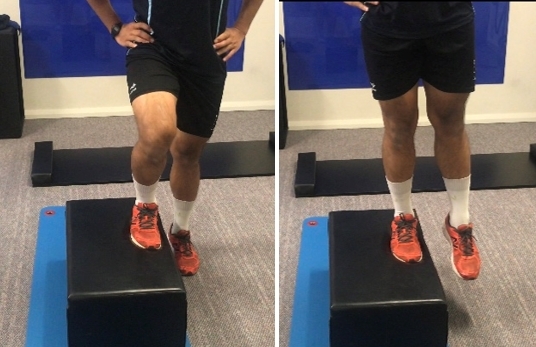 As the glute Med helps to provide stabilisation of the pelvis during walking and running, this muscle also provides activation via stabilising the stance leg during movement of the the swing leg. Lift one leg up at 90 degrees (opposite hand and leg like running motion) Then with the same leg you are going to reach back and touch your toe lightly on the ground behind you, then back up to starting position. Slight bend in the knee as you are performing the exercise. If this is too tough to do, you can place an exercise ball against the wall and follow the directions above.